Peepers is doing great! He's transitioned to our pet yard bird now. He hangs out in the trees surrounding our backyard and returns to the porch calling for me when he's hungry. For a while, he was begging to be hand fed all day long. He's down to a few times a day now, and sometimes darts away from me in lieu of being fed. His bird skills are improving - yay!! Y'all probably think I'm nuts, but I've grown quite attached to my feathered child. I've been feeding this bird for over a month now. He's quite sweet and very smart. I know that eventually he'll stop coming around and have a 'real' mockingbird life, which is the goal. Part of the pleasure of caring for a baby bird is releasing them. Grow up and go out and seek your fortune, Peepers!! A few people have asked how did I take care of him? I did A TON of research online trying to figure out what to do to keep this bird alive. It seemed impossible and I didn't even think he had a chance at survival at first. He was just so tiny and it's so hard to duplicate a mamma bird. I actually almost gave up because it seemed hopeless, but every morning there he was gaping to be fed. Every day I grew a little more hopeful that he just might make it. 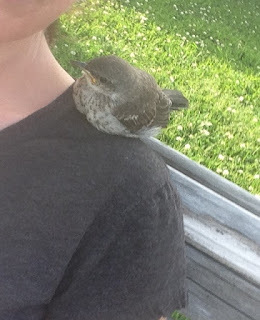 If you do find yourself with a baby bird, everything you read will tell you finding the mom is the best bet. Sometimes though it just isn't an option. This is what I did for Peepers. 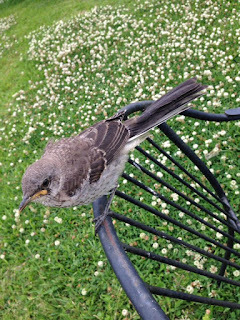 He was a 4 or 5 day old mockingbird chick when I took him in. * Baby birds need to be kept warm. I put Peepers in a box and made him a 'nest' out of a towel. I put a heating pad under the box for some warmth. I also made him a sock buddy. I filled a small sock with rice and microwaved it a few times a day. Peepers cuddled right up to it and it stayed warm for a good while. * I fed him every 20-30 minutes at first. I used Purina Kitten Chow soaked in warm water and fed him using the handle of a plastic spoon. He took to it right away, but I've read sometimes you have to force them to eat. If the bird is cold and the food is cold, the bird won't eat. Keep the bird warm and feed it warm food. Thankfully mamma birds sleep all night so the constant feeding is only during daylight hours. Baby bird will sleep all night, too! *I took his box outside for a little sun every now and then. Sometimes it seemed to upset him, so we didn't stay very long. He'd get really agitated and start breathing with his mouth open which means he was stressed. 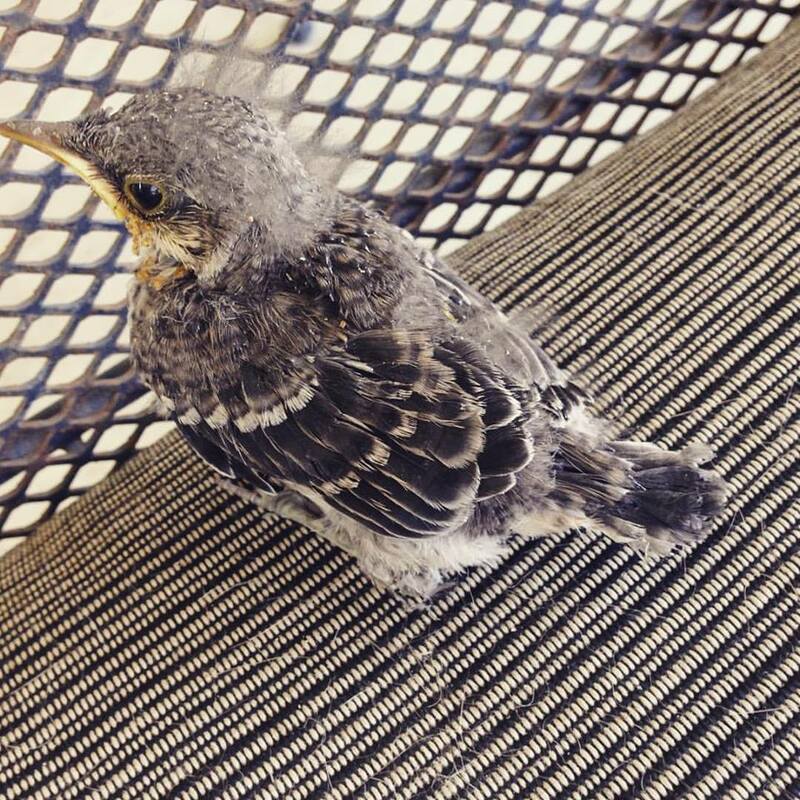 * When he was almost fully feathered, I moved him to a tall laundry basket. I covered the top with netting and put a stick through the holes in the basket to make a perch. He looooved the perch once he figured it out! I added more perches and different heights and before long he could flutter to reach them all. 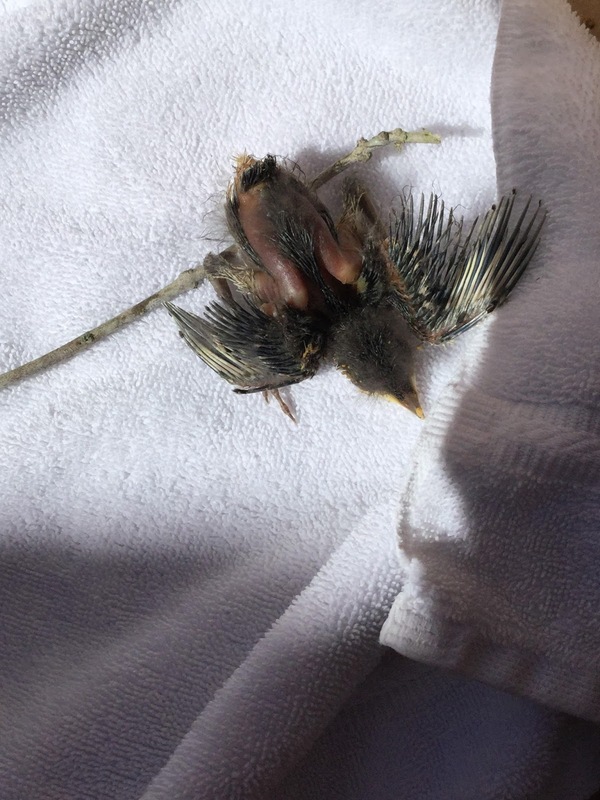 * Once he could fly a little, I started putting him in the tree where his nest was. Several times he hopped in the nest and went to sleep! I started with a few hours of tree time and worked up to all day tree time. I'd check on him often and feed him, of course. For a long time, he just sat in the tree. He had no idea what to do. Eventually he caught on and started leaving the tree, but he'd always return. I'd put him in his cage at night and put him back in the tree in the morning. I was still hand feeding him all day long as he didn't have any interest in trying to feed himself. *Finally, he seemed to have enough 'bird skills' to be left out at night. He had a hard time learning to eat on his own. I was overjoyed to see him eat a bug! For the first few days, he was at the back door begging for food constantly. He'd start at dawn - peeep peeeep peeep. He'd get quite angry if mealtime was delayed. 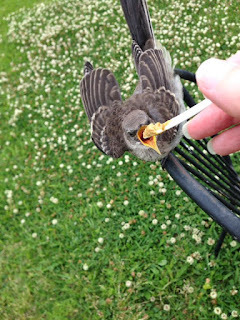 I held off and little by little am hand feeding him less and less. I see him pecking around on the ground, so he's getting it. He's on his way to being independent!! Peepers is 5 weeks old now and doesn't go far. I do go out and call for him every morning, and sometimes he'll fly to the fence wanting a few bites of his baby bird food, but sometimes not. Sometimes I hear him calling me from the trees to go out and feed him! It truly has been amazing watching this little bird grow. Our Peepers is still hanging around. He's a few days shy of one month old now. (I call him 'he' but I strongly suspect he is a she!!) Last night I left him outside for the first time. For a while, I was letting him free during the day and caging him at night. He was picking the most undesirable spots to sleep, like practically on the ground. I wasn't sure he had enough bird sense to fly away from a predator, so I thought it was best to put him some place safe. The neighbor's cat has stalked him and he flew away, so at least there's that!! Peepers still hasn't gained his independence though. He flies from tree to tree and has even left the yard, always to return to be fed though. He pecks around and I've seen him eat a few small bugs. I can hear him calling for me about 6am as the sun comes up. He gets quite angry or HANGRY if I don't feed him right away. It's quite funny and hard not to give in to his demands. He wants his baby bird food and he wants it NOW! Just WHO has WHO trained here? The cats are just mesmerized by this feathered creature that hangs out on the porch. He's making progress though. Peepers first wouldn't leave the tree where the nest is. Then he started venturing onto the porch. Then onto a tree in a neighboring yard. 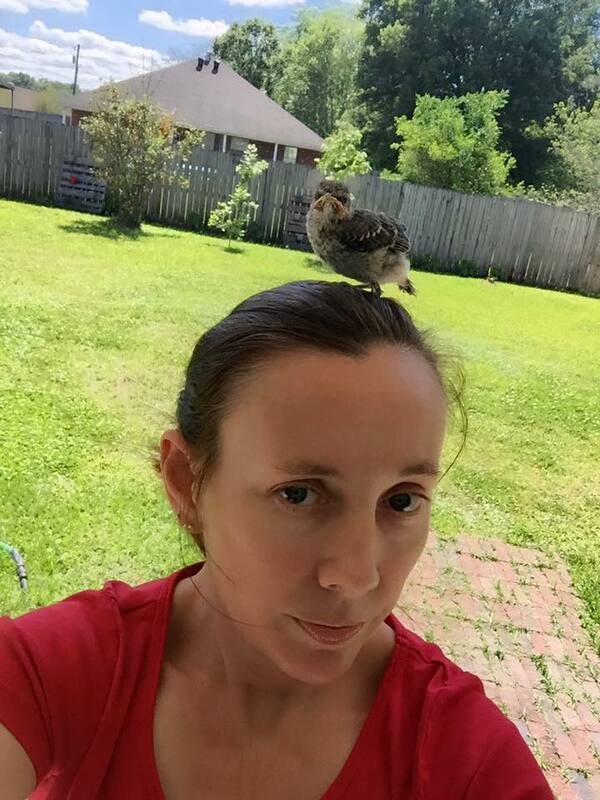 He still perches on my head or shoulder, but seems to balk at being handled. After a few bites of food, he'll fly off only to return later. It's cute as can be, and I am quite fond of him, but at some point it's got to end. I can't keep feeding this bird every day, all day. He needs to learn to be a bird. I'm hoping that little by little I can ease up on hand feeding him and he'll eventually be off on his own, as a wild bird should be. Most importantly, he's come a very long way from being at death's door when I found him. 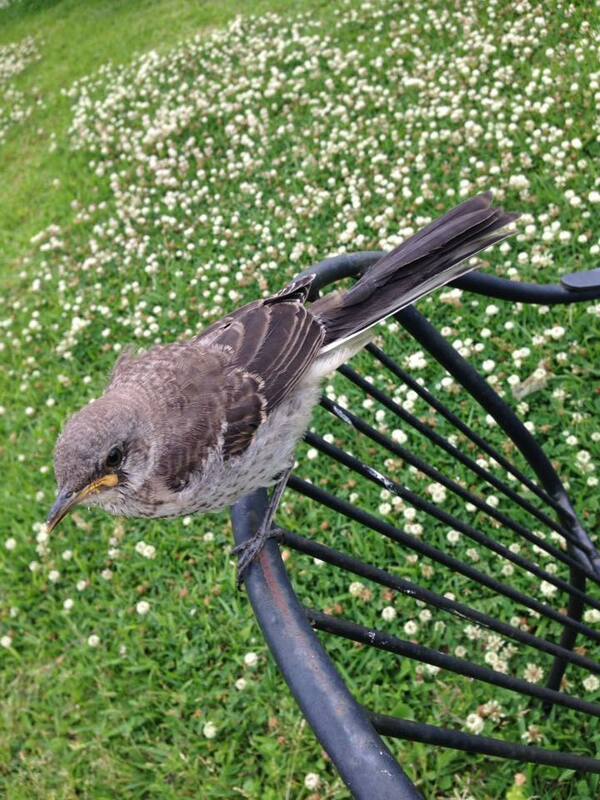 For now, it seems we have a pet mockingbird or maybe it's the other way around?? The weeks leading up to Easter were sickly ones. Veronica had tonsillitis. Valerie had bronchitis. Then I got hit with it also and was down for a few days. Val hadn't quite recovered completely and she got sick all over again. After doctor visits and prescriptions, we all seem to be on the upside of it finally. On Good Friday, a friend of ours who recently moved back to town came to spend the afternoon with us. I cooked some white beans and rice, and Clint fried some cat fish, red fish, and shrimp. We dyed Easter eggs with the kids and had a low key afternoon. Easter Sunday was even more low key. I do believe the Easter Bunny has made his last appearance, as neither kid was all that interested. Veronica seemed a bit excited, but no where near as in past years. Usually she'd go on and on about the bunny passing, but she said very little this year. She did want to leave out carrots. She also got up in the middle of the night to check if the bunny had passed and had trouble sleeping, but that was it. 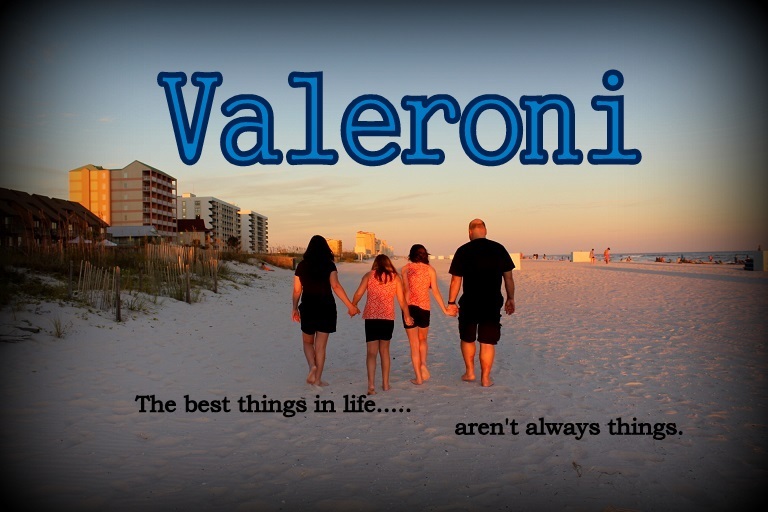 Valerie couldn't have cared less. She didn't even want to get out of bed Easter morning. She had zero interest in finding the eggs the bunny hid. She looked through her candy and that was about it. They are growing up. We had Easter dinner together and did pretty much nothing but watch TV and eat candy all day!! I hope everyone had a Happy Easter!! 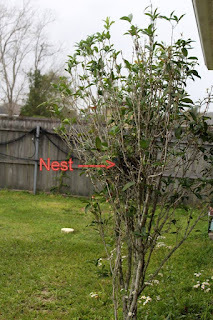 While we were away at Disney, a pair of mockingbirds decided to make a nest in the Sweet Olive tree right next to my back porch. 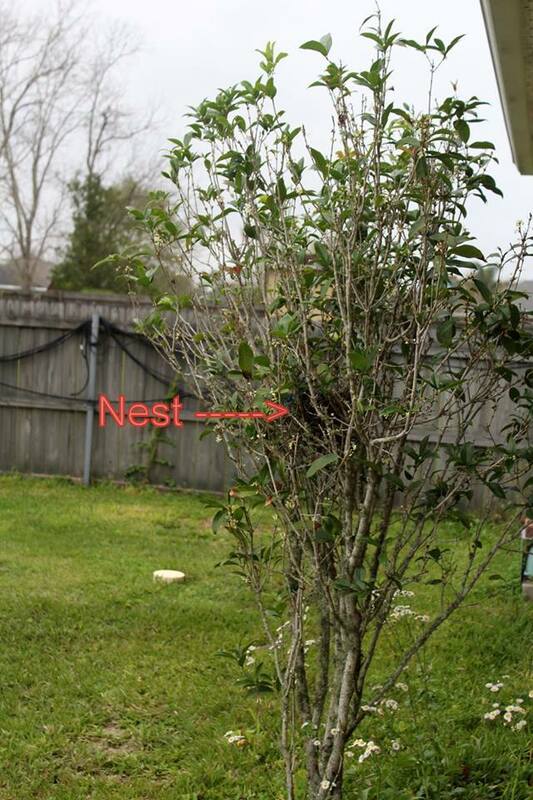 The tree isn't very big and the nest wasn't far off the ground at all. I guess no one was around and all was quiet, so the birds thought it was a good spot to set up shop. 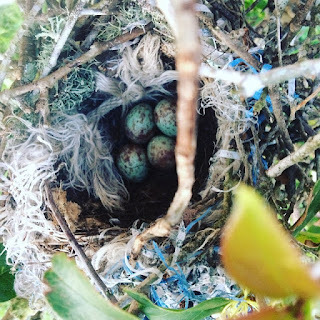 I first noticed the nest a little over a week after we returned. I saw a bird fly out of the tree and spied the nest. I thought it was an odd place being so low as there are so many CATS around who could easily get to them. I peeked in the nest when the birds weren't around and found four speckled eggs. I read up on mockingbirds and estimated they'd hatch in about a week. On Friday, March 24, I used my phone to snap a pic over the nest and saw babies!! Little bitty baby birds. Awwwww. By Tuesday, we could see their heads popping over the nest and hear them peeping. I went out back and the mamma (?) bird flew off the nest the second she saw me. Later, Val and Roni wanted to see the babies, so we went next to the tree and looked at them reaching out of the nest once more. Lots of peeping while the mamma perched on the roof and squawked at us. I guess it was too much and we were just too close. Wednesday I went out and didn't see any birds begging to be fed. No peeping. I looked closer. Sadly, they were all still. And quiet. With no sign of mamma or daddy bird. I was so sad. I don't know if something had happened or if mamma stopped feeding them and abandoned the nest. She was there the day before, so had she quit feeding them long before? A few hours later, I thought maybe I should go make sure. 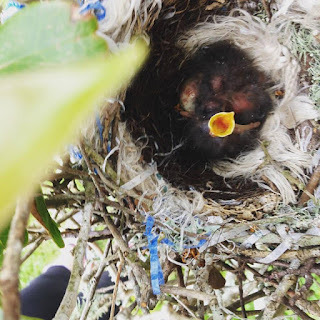 This time I shook the branch the nest rested on, and up popped ONE tiny gaping beak. Peep peep. It's been well over a week now since I've taken this job. I can't be away from home long because I have to feed the bird. I'll be damned if this bird is going to die on my watch!!! I've been keeping him warm and cozy with a heating pad. I bought him some special baby bird food and meal worms. I made him a 'cage' out of a tall laundry basket and some tulle to cover the top. He's doing quite well and I hope he's independent enough to release with in the week. He peeps at me when he sees me, hence the name Mr. Peepers. Sometimes he just stares at me as if he is trying to figure out who I am. Or maybe he's trying to think of a way to say "Thank you." Clint celebrated his birthday last week on March 24. Yay! He likes wacky t-shirts, so I thought I would give Loot Crate's Loot Wear subscription a try. I signed him up for a six month t-shirt subscription. They would ship him one novelty tee a month. It was not expensive, only $43, but my credit card was charged with in seconds. The website and the email I received claimed that the first shirt would arrive before the end of the month. You did it! You've successfully subscribed and we're thrilled to welcome you to the Looter community. Your first package should arrive between the 20th and the 28th if you ordered by the 19th. Otherwise your first package will arrive next month. (Don’t worry, you’ll get a tracking email. Just a note, if you have any other Loot Wear subscriptions, you might receive just one tracking email in the case that they get combined). Remember, this is a 6-month recurring subscription. That means after you receive your 6 packages, your subscription will automatically renew (unless you cancel or there’s a zombie apocalypse). Sounds great. Okay!! I figured there was a 50/50 chance that the first shirt would show up before the 24th. In fact, here it is April 3, and we still have no shirt. I managed to get a tracking number out of Loot Crate's Customer Support and the shipping label was printed a while ago on 3/20. Then nothing. It hasn't actually shipped yet. Hmmm. I decided to check Loot Wear's Facebook page, and found comment after comment asking about the delay, asking for updates, asking for tracking, etc. So it wasn't just me. They are having some problems fulfilling orders in a timely manner, but are being very vague about it. Once we ship your shirt, you will receive a tracking email. Unfortunately, the March shirts and underwears are delayed and we do not have a specific date of when they could be expected to be delivered. So, basically what Loot Crate / Loot Wear is saying is that they have NO IDEA when March orders will ship. Well my happy self replied and said to cancel the whole thing. If I ordered a March subscription box, I expect to actually receive it in March. After reading the Facebook comments, delays seem to be an ongoing issue. Since the shipping label had been printed, they would not let me cancel March, but I was able to cancel the rest of it. I also filed a dispute with my credit card company. I've been reading through the posts on their FB page and made a few comments. I told them I was unhappy with not receiving what I paid for on time. I seemed to be getting the runaround with out any direct answers. I replied to a few others who had the same issue as I did. Bye bye Loot Crate. I shall buy no more from you.